Here is another product that I received the pleasure in trying with Indian Harvest. They are a company with exotic grains, rice blends and legumes. Located in Bemidji, Minnesota, they are in prime wild rice country. Also Indian Harvest has become one of the country’s premier provider of these different blends and also have gained a very loyal following in the culinary community . The grain that I got to try is called Farro, an ancient strain of cultivated wheat, best described as the heirloom version of spelt. I have never tried this grain before but I did a little research and I have read that its great for some risotto. But of course me being who I am and always wanting to come up with different platters, I just decided to cook it up as instructed. I thought of having some salmon with it and some sprinkles of goat cheese and fresh parsley, adding some raw zucchini (which if you have never had raw zucchini it’s such a yummy little snack and great for salads). 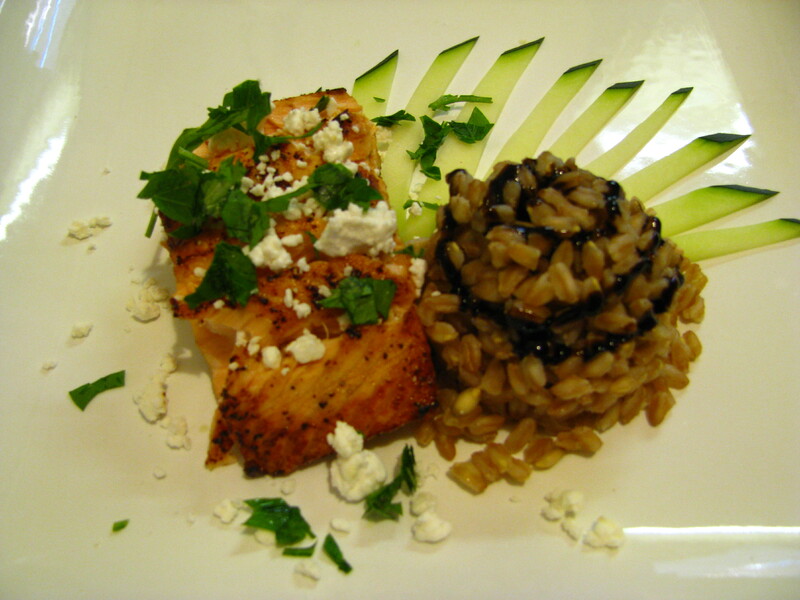 I drizzled a little bit of Balsamic Glaze on top of the Farro. The flavors all came together so well that you will want seconds. I love the way you plate your dishes. That’s something I need to practice more.